read Mark 6. If you walk up the steps of the New York City Public Library, within two minutes of leaving Fifth Avenue you can see a Gutenberg Bible. You don’t need to pay. You don’t need to check your bag. You walk straight in off the street. And there it is, lying under a glass case: a real Gutenberg Bible printed in Mainz, Germany. It dates from the year 1455. It’s enormous. And it’s completely illegible. It has no pictures, at least not on the pages that are displayed. It’s in Latin. It’s printed in some kind of curly calligraphy, so that you can’t even make out the few Latin words you might actually know. 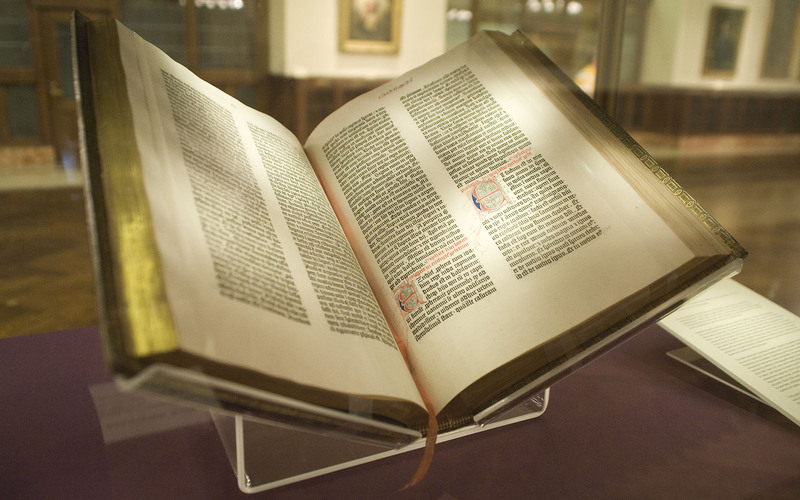 Looking at that completely illegible page of the Gutenberg Bible is what the experience of reading the Bible is like without the Holy Spirit to guide us. On the face of it, Mark 6 is full of wild swings between two types of people: those who reject God and those who accept Him. So much happens in the chapter it’s exhausting. First, Jesus is rejected at his hometown of Nazareth. Jesus says that a prophet is honored everywhere except in his hometown and among his own family. Jesus can do only a few miracles in Nazareth because of the people’s unbelief. Another translation says that because the people took “offense” at him, it “hindered them” from acknowledging his authority. Mark 6:3 Amplified Bible. Then Jesus sends out his twelve disciples. Out they go, listening to him and obeying his command, accepting him at his word, and boom: they “cast out many demons and healed many sick people.” Those who accept Christ get power. Those who reject him are hindered from having his power work in their lives. The chapter swings again to rejection. Mark tells the story of the beheading of John the Baptist – a story depicted frequently by male artists, eager to show the blood dripping off the severed neck of the prophet. Although Mark says that King Herod respected John the Baptist and liked to listen to him, Herod liked the approval of the crowd more. Herodias, Herod’s wife, hates John because he says she sinned by jumping ship from one brother to the other. Herod “couldn’t refuse” the dancing girl’s request because of the “vows he had made in front of his guests.” It doesn’t seem to have occurred to Herod that any time we disobey the laws of God – and murder an innocent man, for instance – we are giving up all of our kingdom. He could have found an out in his own vow, but he lacked the courage to do so. Herod’s idolatry of the crowd trumped his desire to obey God. The story is haunting on many levels. The moment people start talking about Jesus, Herod’s first thought is that Jesus must be John the Baptist, come back from the dead. Once again, the rejection of God leads not to peace, power and joy, but to guilt and death. After telling of the death of John, the chapter swings again into acceptance; Jesus feeds 5,000 people who have followed him to a remote place. The miracle, by the way, to me raises the question of why stop at 5,000: why didn’t Jesus feed all the people on the planet while he was at it? He was God’s Son. Couldn’t he just have said the word and made bread appear in front of every human alive? Of course he could. But he didn’t. For reasons that are not immediately apparent, it seems that following Christ is a prerequisite for being fed by Him. Then comes the stunningly beautiful moment where Jesus walks on water. Is this a moment of acceptance or rejection? The disciples think Jesus is a ghost. They are “terrified” at the sight of him. They’re “amazed”, Mark says, “for they still didn’t understand the significance of the miracle of the loaves. Their hearts were too hard to take it in.” Mark 6:52. The disciples, in other words, have trouble accepting that Jesus can walk on water. So why do the disciples seemingly reject Jesus walking on water, even though they have already made the choice to accept Him? How do the disciples still have hard hearts toward Jesus? They have seen so much, and yet they can’t seem to understand how a man can walk on water. Here is where we return to the Gutenberg Bible. To us humans, the surface of a lake is as “illegible” as a page of writing in a language we don’t understand. We cannot see how to step out on water, any more than we can read Latin without having studied it; any more than we can remain calm after we’ve made a mistake; any more than we can trust God when everyone else is getting the very thing we’ve always wanted, but there’s no sign that we will; any more than we can stop making the same wrong choices over and over again; any more than we can prevent ourselves from throwing God and his laws under a bus if we find something we think we want more. No matter how many miracles we see God do in our lives, we come up against our hard hearts; we find places where we just don’t believe He can do anything. Or we find that like Herodias, we really get angry when someone confronts us about a certain sin. We can sit at God’s feet one day, and like the 5,000 people Jesus fed, we can eat “as much as we want” and be satisfied – and then the very next day, perhaps even the very next minute, we feel dissatisfied. In other words, even when we choose to accept Christ, we still find ourselves full to the brim of the very same faults as those who reject Him. So what’s the solution? How do we translate our choice to accept Christ into victory? How do we feel joy even when we’re hating ourselves for some dumb choice; or hating some poor kind soul who has the guts to tell us the truth; or hating God for not giving us what we want at the exact moment we want it? What does the Holy Spirit explain to us about our annoying tendency to fall into the bad behaviors illuminated in this chapter? As usual, the answer, I think, lies in the strangest verse in the entire chapter. When Jesus sends out the disciples, he tells them to take nothing for the journey. The instruction not to take money or food makes sense to me. They are supposed to depend on God. But the sentence I don’t understand is that Jesus does not allow them “to take a change of clothes.” Mark 6:9. Hold it. They can’t take any fresh clothes? Who would invite them into their home if they smell bad? They live in a hot country. How can they wash their clothes if they don’t have at least one extra outfit to wear while they’re wringing their robes out in the lake? Are they supposed to ask their hosts for clean clothes? I don’t get it. Why can’t the disciples take just one extra robe? Wouldn’t that be more practical? In thinking about this lack of practicality, the Holy Spirit begins to open up this Bible passage. The Spirit breaks apart the illegible calligraphy. God opens our eyes to understand his foreign ways. God took nothing for His journey with us. Jesus had one robe, and even that was taken from Him on the cross. God sacrificed everything because He loves us. He asks only that we accept Him. He knows that we won’t accept Him perfectly. But in the moment when we find our hearts hardening, our doubts thickening, and our hatred mounting, we still have victory, because our salvation is not dependent on our day to day choices to reject or accept Him. Our salvation is based upon the fact that He took nothing for the journey, so He could give us everything. He clothes us with His perfection, not ours. So when you’re bathed in sweat because you’re running late, and you can’t believe how little you’ve gotten done, and you wish you had a different life, and a different personality, and why can’t you get your act together, at least this once – just stop. It’s okay. It’s okay to feel that way. It’s okay to get all worked up over nothing. You’re being human. You have victory, even in this moment of seeming defeat, because the true battle has already been won. And paradoxically, the more we wrap our brains around the incredible power God makes available to those who choose Him, the more buoyant we become. We don’t need to pay anything. We don’t have to check our bag. We don’t have to change our clothes. We walk straight in, just as we are, right off the street. And there He is. Not the Gutenberg Bible, but Christ Himself, waiting for us. Not under glass, but available, ready to give us everything He has. Everything. No matter how dirty we feel. And in believing that we, too, can walk on water. After all, if God Himself wants to take all your burdens, what is left to weigh you down? There’s incredible freedom, we discover, in Christ’s command to take nothing for the journey. What looked like nonsense, makes the most sense of all. This entry was posted in Mark and tagged Caroline Coleman, Caroline Coleman blog, Christianity, Jesus, Loving Soren, Mark, New Testament blog by Caroline Coleman. Bookmark the permalink.